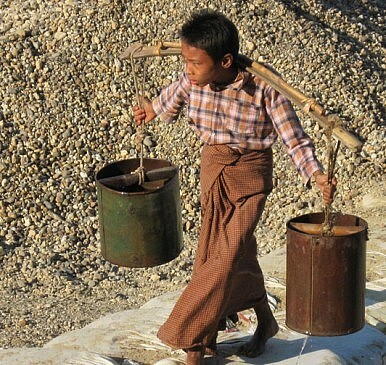 Although child labor is illegal in Nepal, 1.6 million children are in the workforce. Girls have it the worst. Brishkae is ten years old and works a grueling 16 hours in the carpet making factory. Many of her friends in the factory who work with her are just as old and some are even younger than her. She earns enough money to give to her parents, both of whom do not have jobs. She doesn’t go to school, and has only seen schoolhouses from the outside. She is not alone among the 1.6 million children like her in a country that has been described as one of the worst places for children in the world. According to the Nepal Child Labor Report, about 1.6 million children in the country are working in different industries despite the fact that child labor is illegal in the country. Children of all ages work as porters, electricians, car mechanics, factory workers and as agrarian laborers. Most of these children are under the age of 14, with more girls than boys represented in the child workforce. Many of them are employed in the carpet making, brick kiln and garment industries. Many others work as laborers on the street and on farms. Although the government of Nepal has vowed that it would eliminate child labor in Nepal by 2020, human rights activists are skeptical of this considering there seems to be no visible efforts taking place to deal with the situation. Ranjan describes his frustration working with the government while establishing his Education Development Project for Child Laborers – an organization that aims to deal with the problem by paying children hourly wages to come to school and take classes. Ruchita, 14, told The Diplomat that she is the only child working in her family. Her parents send all of her four brothers to school. Nepal also has what it calls the National Children’s Policy, which essentially protects children from physical, mental, and sexual abuse as well as exploitation. Dr. Akmal, however, argues that this policy has no effect on the ground in the absence of compulsory education and awareness about children’s rights. The country provides no legal protections for children ages 16 and 17. This age group is one of the most manipulated by child labor practices. While Nepal’s Interim Constitution of 2007 guarantees the rights of children, and the country has signed major international conventions against child labor, enforcement of these policies and laws remains weak. Human rights activists say it will take much more for the government of Nepal to eradicate child labor than just passing laws and policies. Nepal’s two transitional justice mechanisms have failed to deliver justice to war-era victims. What’s Wrong with India’s Efforts to Check Human Trafficking?Nepal’s Success in Wildlife ConservationModi’s Desperate Move to Rebuild His Image in NepalSri Lanka Isn't Serious About Transitional JusticeIs This the End of India's Influence Over Nepal?